For a democratic secular Iran. For peace and prosperity in the Middle East. : Mr Prosecutor, how did it make you feel? Narges Mohammadi is not a threat to Iran's national security, she is not a Western agent and she is not an infidel. She is a mother of two and an Iranian human rights activist who has campaigned for the abolition of the death penalty for minors under 18 in Iran. She is also an executive committee member of the National Council of Peace in Iran, a broad coalition of Iranian writers, artists, trade unionists and social activists who campaign against military action and war. On 21 April this year, security agents arrested her from her home in Zanjan, before the eyes of her elderly mother and two young children and took her to serve her six year prison sentence. 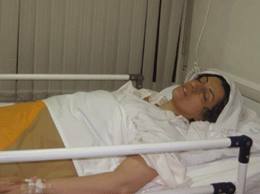 Narges Mohammadi has developed an unexplained disease, likely to be due to the stresses of her interrogations, where she suddenly loses the control of her muscles and becomes temporarily paralysed. Her arrest and the manner in which she was taken away from her children, has prompted Dr. Mohammad Maleki, Tehran University’s first Post-Revolution chancellor, who himself has spent several prison sentences in the Islamic Republic, to write an open letter to the Chief Prosecutor, Abbas Jafari-Dolatabadi. "Until when do you think you, your masters and other tyrants will be able to continue with your criminal acts?” the letter went on to add. “Over the past 33 years, you’ve set our beloved Iran ablaze. Look around you, do you see anything other than corruption, theft, deceit, addiction and enmity? Rest assured that the Iranian people’s spring of freedom is near, and it will be too late for the oppressive rulers to be remorseful,” Maleki continued. Narges Mohammadi's case is yet another testimony to the insincerity of the peaceniks in the West. Surely if their true agenda was against military intervention and war only, they would have campaigned for the release a fellow peace activist in Iran like Narges Mohammadi. Instead they continue to remain silent on the human rights abuses by the tyrannical regimes and allow themselves to be used as a propaganda tool for the likes of regimes who imprison other fellow peace activists. Seem like Waybec is right. I check Press tv webpage comments too and there no interest in speaking truth about their own suffering people. Only things which might help their evil government. I try post comment too but nothing happen. All they interest in is hate. Hate for Israel, US, UK and even EU. In fact most comments just seem like lies posted from people who work for Press tv. The desperation of its regime. Please check web page if you no believe. One could say the same about those in the west denouncing corruption, and human rights abuses by the tyrannical regimes but who say not a word about the countries they live in.